United World Telecom has been in business since 1996 and has a reputation for providing virtual phone solutions to thousands of customers across the globe. 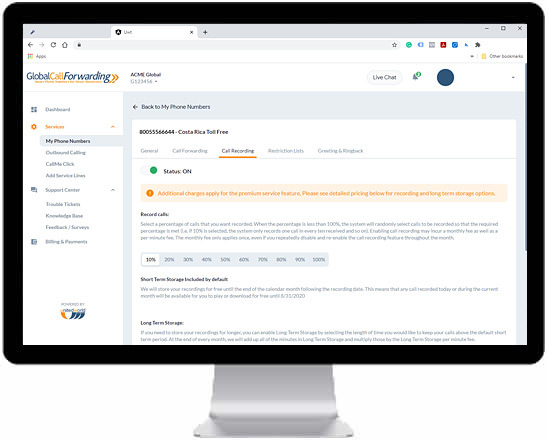 We are proud to offer 24/7 customer support and one on one account executives to help customers manage their service and use the advanced features associated with our service. Our specialty is providing companies with an international footprint and unmatched quality of service across the board. With our advanced control panel, you are able to easily set up an unlimited number of extensions (Press 1 for sales, press 2 for support..etc.) that callers can select when they dial your new number as well as additional settings for call routing. International Call Forwarding for Businesses. We have numbers available in over 140+ countries that can be forwarded to virtual call centers, VoIP/SIP, landlines, mobile phones, or business phones in virtually any country. 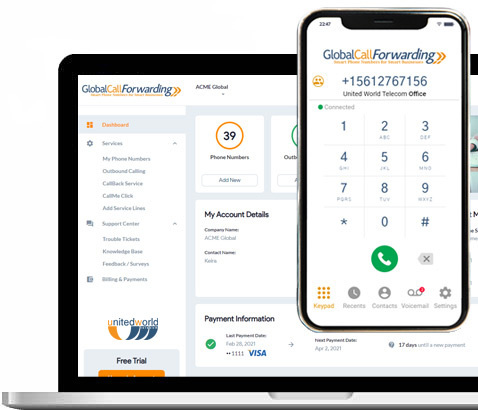 With the numbers you purchase with us, you can not only receive inbound calls, but you can also make outbound calls (premium feature) with corresponding caller ID’s. We provide detailed proposals and custom pricing for enterprise level accounts. You can request a proposal / quote here. We offer a free trial for most of our available numbers which includes a call credit so you can test the service before you buy. Purchasing virtual phone numbers and virtual phone system solutions from United World Telecom will empower your business, and give your customers a convenient way to communicate. With over 20 years in the business, we specialize in cloud based solutions to keep your business connected. With virtual phone numbers in over 140+ countries and a constantly growing inventory, United World Telecom is the worlds leading provider of local and toll free numbers across the globe. Our customers have access to a wide range of included and optional features via a simple control panel. Some of the features included with our virtual phone systems include voicemail, unlimited extensions, API access, an advanced IVR / PBX, customized greetings, time of day routing, failover forwarding, voicemail to email, fax to email, local ringback tones, simultaneous ringing, sequential forwarding, select country forwarding, call transfer, black lists & white lists, and more! Some premium features of virtual phone numbers with United World Telecom include outbound calling, rollover, and SMS forwarding to email.